So that's what they're REALLY called! Russian stacking dolls = just a cute, *simple* label for matryoshkas. Ah! See, read Lose That Girl daily and you might actually learn something! It might not be something useful, but at least it's something! 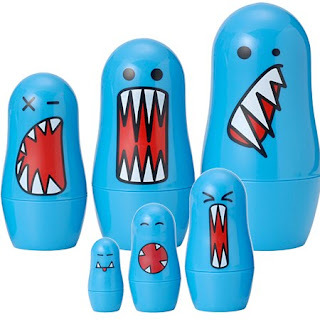 Anyhoo, this snarly sextet -- Fang Matryoshkas -- all jagged teeth & eerie pallor, are actually quite fetching, charming even. Send your Russian peasant stackers packing & nab your fang gang at Perpetual Kid.